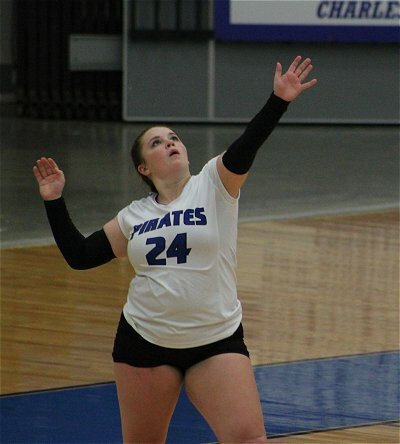 The Charlestown Lady Pirate Volleyball team improved to 9-9 on the season; but also 5-2 in MSC play Thursday evening by defeating host Salem 3-2. Charlestown dropped the first two sets 22-25 and 24-26; but then hit their stride to take the next three sets 25-14, 25-16 & 15-8. “Tonight was a big conference win for us against a good Salem team. We started rough in the first set allowing ourselves to get into a 2-10 deficit before we started to play. Salem did a nice job with their blocking that first set and we were not covering or adjusting. We started to gain momentum at the end of that set but couldn’t pull out the win. We have had some injuries and had made some adjustments to our line-up over the last several weeks, but went back to our normal line-up in the second set. Instead of carrying that momentum into the second set, we again got ourselves down 4-10 before starting to play like we know how. Finally, in the third set we started to put it together”, summarized Lady Pirate Head Coach Tammy Nuxoll. The Charlestown offense was led by Senior Emalee Craven (also named the Coyle Chevy, Buick, GMC, and Coyle Nissan Player of the Game) who logged 20 kills, Kaia Reid contributed 15, and Kiersten James added 12 kill in the victory. Maddie Nuxoll ended the night with 47 assists and 5 kills of her own; while Chrissa Ledbetter stepped up the passing in the later sets of the match and recorded 11 digs. “I’m very proud of the way the team held it together to come back and win in five. This was our third match in a row and the team will get some rest tomorrow before heading into the Borden Invite on Saturday”, concluded Coach Nuxoll. The Charlestown JV team unfortunately lost to Salem 14-25, & 23-25 Thursday evening.